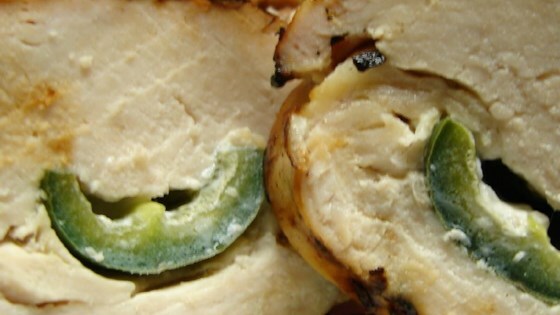 "Stuffed jalapeno peppers are wrapped in marinated chicken breasts. Tasty bacon seals the deal!" Place chicken breasts in a dish with the Italian dressing. Cover, and marinate in the refrigerator at least 2 hours. Stuff each jalapeno half with cream cheese. Roll chicken breasts around jalapeno peppers. Wrap each chicken breast with a slice of bacon. Secure with toothpicks. Lightly oil the grill grate. Arrange wrapped chicken breasts on the prepared grill. Cook for 20 minutes, turning frequently, or until bacon is browned and the chicken juices run clear. Chicken charged with spicy popper kick! Was disappointed with this recipe. It took a bit of time and was looking forward to it but overall for all the time it took was not worth the effort. Wonderful recipe! I made this at a family cookout and it was a hit. Used the jalepenos in a jar so they were very juicy, but not too spicy. Now I crave this every time we barbeque! I thought these were excellent. My husband and kids removed the jalapeno after cooking and enjoyed them like that. I'll keep making these! Thanks.